We are already in the 3rd week of September but there is yet to be a firmware rollout with the September Security patch. A few firmware rollouts did have a kernel build of September but security dating back to August. Also, Samsung is still steadily seeding out OS based platform updates to its devices. Although lately, we saw Samsung dropping OS updates for its older devices but comparative newer devices are not behind too. This time Samsung rolled out the Android 7.0 Nougat update for Galaxy On Nxt. On Nxt was released earlier this year with Android 6.0 Marshmallow out of the box. It is a mid-range device. The update is seeding as OTA update for the 64GB variant of galaxy On Nxt. The current update will take the Samsung Galaxy On Nxt to the software build number G610FXXU1BQH8. This 7.0 Nougat update for Galaxy On Nxt is based on the August 2017 security patch update. It weighs a little more than 1 GB. Also, the Android 7.0 Nougat packs together amazing features such as Merged notifications, dual messenger, in addition to regular bug fixes, stability improvements, Google Doze, multi-window etc. The upgrade is rolling as an OTA (over-the-air) update. Every device will gradually receive the update in the coming days. But You can also manually install the firmware by directly downloading it from the Samsung servers. The most awaited Android 7.0 Nougat update for Galaxy On Nxt brings in the following new features and upgrades. Android 7.0 Nougat system update. The new dual messenger function. August 2017 security update patch. Let’s take a quick glimpse of the details of the firmware rolling for Galaxy On Nxt. You can capture the OTA as it becomes available for Your device. You can manually check if the update is available or not by going to your device’s Settings > System Updates. If it is available, download and install it by following the on-screen instructions you are shown. Make sure that your device has full battery charge. Hook to a strong Wi-Fi network to download the update as it is around 1 GB in size. In another way, You can download the firmware too by using a tool called SamFirm. Download latest Android 7.0 Nougat firmware for Galaxy On Nxt. With SamFirm you can download at unlimited speed and for completely free. After you are done downloading the firmware, now Yu will have to install the same and restore Your device to complete stock. To install the firmware you will have to use another tool called Odin Tool. Now, let’s see the steps of manual installation using Odin Tool. Step-1 Download the full stock firmware file. Step-2 Extract the file with .tar extension Nougat. Step-3 Now run Odin Tool. Step-4 Add the .tar file to AP section. If there are multiple files, add them to their specific categories. Step-6 After finishing reboot device to the system. And you may like: Detailed tutorial to install Stock Firmware using Odin Tool. 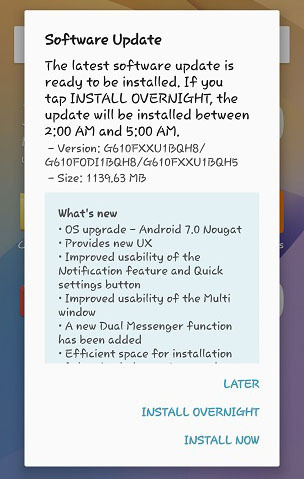 Thus, you are done installing the update and now have upgraded Your Galaxy on Nxt to Android 7.0 Nougat.Enjoy and keep scrolling on AndroidSage for any and every information about Android 7.0 Nougat.